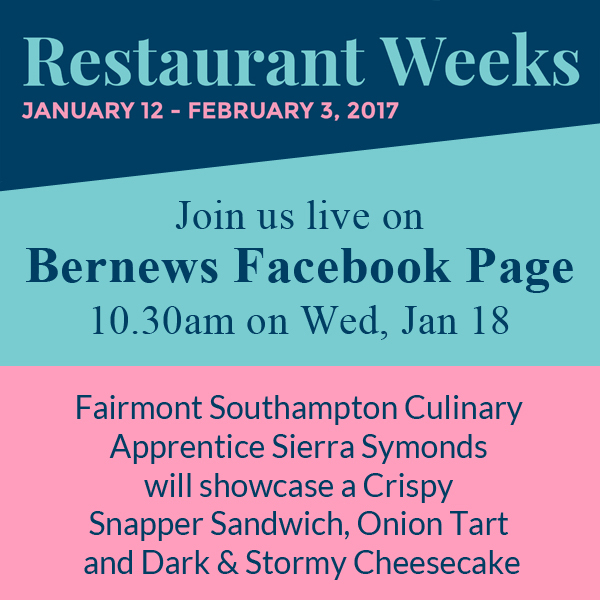 The second live video in Bernews’ behind-the-scenes series of Restaurant Weeks will provide a look at Fairmont Southampton Culinary Apprentice Sierra Symonds as she puts the finishing touches on a Crispy Snapper Sandwich, Onion Tart, and Dark & Stormy Cheesecake. The second live broadcast will be tomorrow, January 18 at 10.30am, and we will set up filming in the Newport kitchen and cover dishes from all three participating resort restaurants, including Waterlot Inn, Newport, and Jasmine Lounge. Ms Symonds is a young Bermudian, and started as part of the apprenticeship program at Fairmont Southampton in March 2016. This year’s Restaurant Weeks is running from January 12 to February 3, and Bernews is featuring an exclusive live video series showing behind-the-scenes look at some of the participating restaurants. Tomorrow’s broadcast follows after the first at Hamilton Princess, which featured Bermudian Chef Juliana D’Estelle preparing and plating a number of dishes. To watch the live broadcasts, visit the Bernews Facebook page, and for those not on Facebook, video replays of the broadcasts will be available on the Bernews website. This year’s Restaurant Weeks features the largest number of participating restaurants ever – 50 – and the introduction of lunch, which is being offered as two-courses for $22. The three levels of pricing for this year’s event are $32, $42 and $52. After August I won’t even be able to afford Ice Queen due to a double delivery from the stork. Best I take advantage of this now. KyleTwins, I know what you are talking about. I have no doubt that I will be in the same boat as you very shortly.